A mum who suffered a cardiac arrest when she was teenager has spoken about family life with her children, who inherited the same hereditary heart condition. Lucinda McNerney (44) was 18 and working in London when her heart stopped beating after suffering from strep throat. The event led to a diagnosis of Long QT syndrome, a condition that affects the heart's rhythm. "I was working in London for the summer, in a hotel with two of my aunts, when I came down with a very bad sore throat - strep throat. I had to go into hospital overnight to have it drained and during that time my heart just stopped beating. I was very lucky that there was a nurse attending to me at the time, and they revived me. "After that I spent few weeks in the ICU and I was diagnosed with Long QT Syndrome quite quickly. It was all very traumatic, my mam had to fly over to London to come see me." Long QT syndrome is a condition which can potentially cause fast, chaotic heartbeats and can be fatal if undetected. After the frightening incident, Lucinda was fitted with a pacemaker and began medication to monitor the heart condition but said that life continued as normal. She began studying Theology and Psychology the following year where she met her husband Frank. When she was diagnosed, it was unclear whether or not Long QT syndrome was a hereditary condition, however after meeting her husband Frank in university, advancements in genetic testing proved that it was passed down through families. Lucinda's grandmother and mum as well as several other family members were diagnosed with QT syndrome later in life. Despite the possibility that their children might live with Long QT syndrome, Lucinda and her husband knew they wanted a family and thought it was something they could manage, as Lucinda had since she was a teenager. "Frank and I always knew we wanted children and we knew that the possibility of our children having this condition was something we could deal with. He said to me 'You've had a normal, happy life, and they will as well'. People deal with all sorts of conditions in life, and manage and we knew this would be something that we could do." When the couple's son Oisin, now 14, was born, it was discovered that he inherited the gene. The little boy was regularly screened throughout his childhood but his mum said some tough decisions had to be made following the discovery. "At the time genetic testing had just been made available, and when I had my son Oisin we decided to have him tested for Long QT. He was borderline, and throughout his childhood we had him regularly screened. That was very important to us. He's been on medication now for the past four years. It's tough because we had to make a decision that he couldn't take part in competitive sports. We didn't want him dropping dead on the pitch, it just wasn't worth it, but things like that can be difficult." The couple's youngest child Dervla (6) also is a carrier of the gene and has been on medication to treat the condition since she was born. While Lucinda says she does not fear her children dying, she said it would be a comfort if more people were trained in CPR. Each year, more than 5,000 lives are lost to sudden cardiac arrest, but without CPR or a defibrillator the chance of survival drops to less than 10pc. "I am a huge advocate of CPR, everyone should know how to do it. It's so important and it does save lives. It triples a person's chance of survival. "I am not afraid of my children dying but I do want them to be safe in the world, and defibrillators do make this possible, and of course CPR training. "In our house we would have a defibrillator, of course, but it's there in just the same way as a fire blanket or a fire extinguisher is... for our health and safety." The mum-of-three says it can be difficult for her daughter Aoife (12) who does not have the condition, as she often feels guilty that she can do things her siblings can't. "We also had Aoife had her tested for the gene, but thankfully she doesn't have it. It was tough because she says she sometimes feels guilty and upset for her brother, that she can take part in sports when he just can't. I do think the unaffected people in a family have to be minded and supported too because that guilt can be difficult to cope with." 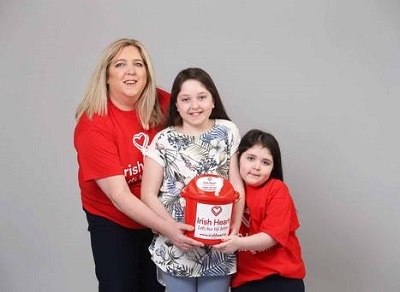 Lucinda who is an ambassador for the Irish Heart Foundation and the chairperson for the Sudden Adult Death (SACD) Council, urged people to avail of screening, which could detect QT Syndrome, which can be fatal. "So many people don't know that they have these conditions until it is tragically too late. It's so vital to get health screenings to detect these hidden defects as it could save your life."